yeah, I kind went overboard on the sugar here…..
Ok, don’t have a heart attack….I did not make these for Grumpy although I do believe he ate one of them. These will give you a sugar high. Seriously. Everyone once and a while I want quick, bread-y, sweet/heat and cinnamon-y somethin’ somethin’. A lot of times when I want something like that I grab a can of Pillsbury Orange Sweet Rolls and just kill the craving. Yesterday morning I didn’t have that can and I, like a bad girl, did not go to the gym that morning so I didn’t have opportunity to go to the store next to the gym afterward. The weather deterred me – so don’t judge me for skipping out of exercising yesterday – or all week for that matter. The weather has stunk this last week. I promise, tomorrow I’ll be right back there. We are supposed to warm right up to 45 by tomorrow and getting out in rain is a little easier than getting out in ice and snow. Anywho….. 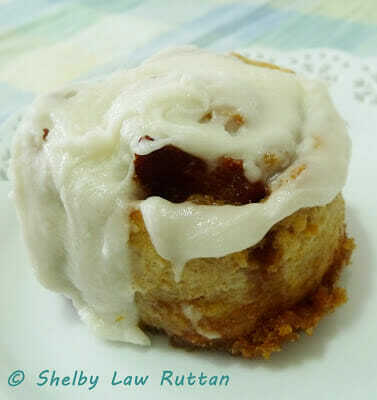 I was craving sweet heat and salt and I had just come across this recipe on Pinterest for Quick and Easy Cinnamon Buns. BTW, Have you joined my at Pinterest yet? If you haven’t please do so I can follow you too! I knew as soon as I saw it I would try it because guess what they have in them? Ricotta cheese! That was different and her rolls looked so good I couldn’t resist. You have those moments too…I know you do! Anyway, I went ahead and made them. They were better than canned rolls but I have to admit, they were not better than a good old yeasty cinnamon roll. If I had a choice, I would choose a yeast roll over a quick one – but hey, these were still good and they hit the spot. I shared with my sweet neighbor Jill and her family so they wouldn’t hang around my house all morning tempting me. Now that I’ve had my naughty treat for the week I promise to be good for a while. I’ve found a breakfast cookie recipe on Peanut Butter and Julie’s site that I intend to try out this week – its a definite healthy cookie and hopefully it will counteract kill my bread-y sweet/heat desire that I caved into. I do like to think I’m cheating by eating cookies for breakfast but being sneaky about it because they are healthy! just look at all that maple frosting yumminess and brown sugar goodness! Heat the oven to 400°F. Spray the sides and bottom of a 8 or 9″ baking pan with cooking spray. Combine the ricotta cheese, almond milk mixture, splenda, melted butter, and vanilla in food processor and process until smooth, about 10 seconds. Add the flour, baking powder, salt, and baking soda and pulse in short bursts just until the dough clumps together. The dough may look like biscuit crumbles, that’s ok it will come right together when kneaded. Turn the dough out onto a lightly floured surface and knead it with floured hands 4 or 5 times until smooth. With a rolling pin, roll the dough into a 12 x 15″ rectangle. Brush the dough with the melted butter, leaving a 1/2′ border unbuttered around the edges. In a medium bowl, combine brown sugar, cinnamon and cayenne. Sprinkle the mixture over the buttered area of the dough and press gently into the surface. Sprinkle with cooked bacon pieces. With a sharp knife, cut the roll into equal pieces – I was able to get 9 rolls. Set the pieces, cut side up, in the prepared pan, touching slightly. Bake until golden brown and firm to the touch, 20 to 28 minutes. Set the pan on a wire rack to cool for 5 minutes. In a small bowl mix the melted, powdered sugar, and maple syrup to make a smooth glaze. Add more syrup as needed to achieve desired consistency. Spread onto warm rolls. These, like the canned biscuits are best served warm and eaten the same morning they are made. I had a couple left over at the end of the day and it reminded me a lot of the canned rolls that just dry out and aren’t as good as they are when freshly baked. You could probably microwave a few seconds (like 15) and warm it up some and it would be fine. I love the whole sweet and salty you have going on here Shelby. bacon and maple are a match. As you well know I am a huge maple syrup person Val :o) I'm also of the belief that bacon makes everything better! I would have NEVER guessed about the ricotta!! I love that you used almond milk too (I'm always buying it from Trader Joe's) These look heavenly. Thank you again for the breakfast cookie shout out! Julie, almond milk is the only milk we use. Grumpy likes it too! I'm getting ready right now to mix those cookies up. I'm excited to try them! Man..I love those orange rolls. My Mom used to make them a lllll the time!!! Now these look downright evil~! What could be better than cinnamon buns and bacon? I am a great bacon fan also. Thanks. this is SUCH a fun combo, delicious!! Oh Teresa, and I was so bad compared to your healthy eating! I aspire to be like you – I'm so impressed with your clean eating plan! 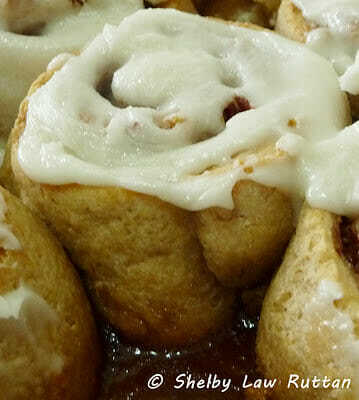 Cinnamon rolls with cayenne and bacon? You're my kind of girl Shelby 🙂 These look crazy good. WOW… I've used cayenne for a long time with chocolates (and it works amazing with Oatmeal Scotchies). Like you say, just a couple of tiny pinches to give the hint of taste. But I have never tried it in cinnamon rolls. What a great idea… saving this one!